There’s a lot to consider when it comes to planning your kitchen design. Where do you even start? Gathering some inspiration in a photo gallery is always a good starting point, as looking at different kitchen designs often brings up ideas you haven’t even thought of yet. 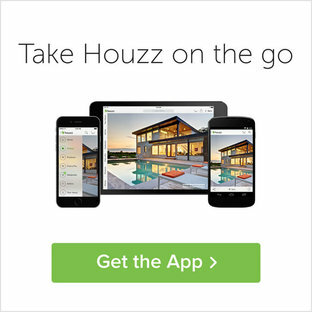 You can browse through photos of all kinds of kitchen styles, layouts and sizes on Houzz to get started before jumping into any design software or contacting a local professional for help. 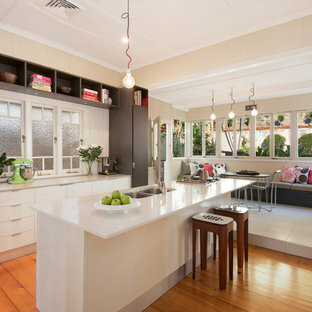 Here’s a few considerations to keep in mind when planning your kitchen. 1. What Makes a Good Kitchen Design, and Why is it Important? For starters, you want to find a balance between aesthetics and function. You may have heard of the ‘kitchen work triangle’, which refers to the space between your fridge, sink and stove. You want everything within easy reach when you’re working in the kitchen and look beautiful at the same time. It’s a good idea to take note of both when browsing our photo gallery. Firstly, consider the space you have, and the limitations that come with it. Do you have a small kitchen and need to maximise your workspace and storage? Can you allow yourself some more space and a big island with seating? 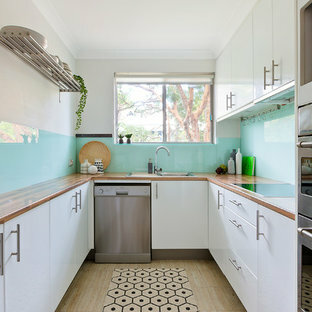 Are you designing your kitchen from scratch or renovating an existing design? Which appliances do you already own and what are their measurements? Are there windows you need to take into consideration when planning cabinets? 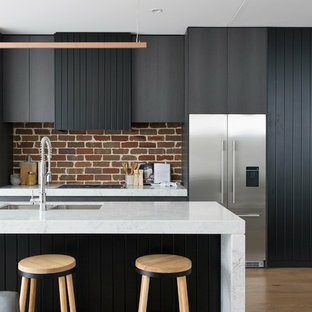 How do kitchen, living and dining areas connect? Depending on your space and needs, you want to use a shape that suits you. U, G, or L-shaped kitchen, with or without island or peninsula? Know your dimensions, plan cabinetry carefully and consider the placement of your appliances. You don’t want to end up with a finished design, only for your significant other to question where the fridge is supposed to go. Consider from the start where your fridge, oven, microwave and sink goes to save yourself from starting again from scratch - remember the kitchen work triangle! You also want to plan the layout of your cabinets. Maybe you’re planning for a pantry and can do with less storage space in your kitchen, so that your design can be one without upper or lower cabinets for a different look. A corner cabinet can be a smart storage solution if you want to keep the look clean and simple. You want the style of your kitchen to reflect your personality and taste. We have curated a large array of kitchen styles here at Houzz, from traditional to contemporary to transitional and everything in between. Consider what your cooking style is for a start - Italy is known for its cuisine, so italian kitchen designs are generally popular. Also consider ergonomics - depending on how much time you spend in your kitchen, the height of your counters can make a big difference to your overall health. 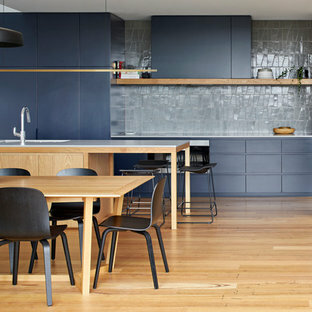 You also want to consider colour and finishes of cabinets, countertops and splashbacks. Which colour do you want your cupboards to be? Simple, timeless white or rather making a statement in black? Maybe rather a rustic wood? Also consider the colour of your floor - if you have dark floors, you may want to keep cabinets lighter. You could also go for an all-white look and choose black appliances for contrast. Once you know which style you fancy, don’t forget how you will be using the space. You want to keep cooking in mind, as well as how easy to clean and maintain the space will be. How many cooks do you need to accommodate? Do you have kids around? How much storage do you need? 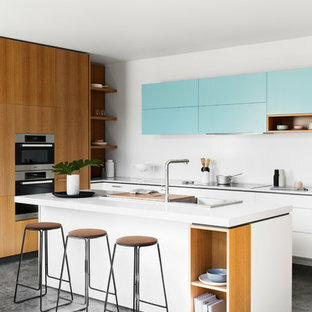 Maybe you want to go for open shelves rather than cabinets and allow for easy reach of key items you use when cooking. Again - remember the triangle! Lastly, choose lighting that both enhances the look of your kitchen as well as your cooking performance, providing light in all the right places. No matter what you plan for your kitchen design, cost is always a big factor. Be sure to plan with your budget in mind. 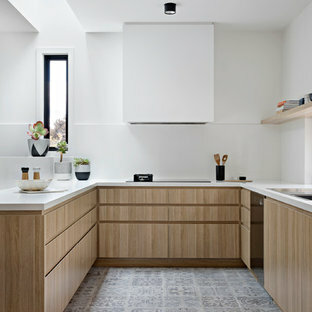 It may make more sense to go for a modular kitchen design rather than custom build. You can save a lot of money if you get at least 3 estimates from professionals before locking in the job. And don’t forget to allow a 20% buffer for emergencies. Once you are ready to hire a pro, our directory will help you find one, no matter where you are. So whether you're looking for an Interior Designer in Melbourne or an Architect in Sydney, you can be sure to find a qualified expert for the job! 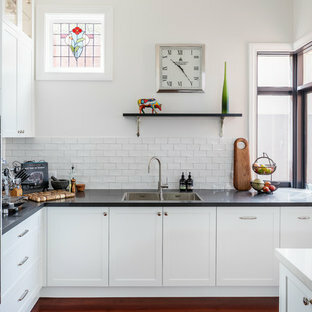 Notice the two colour benchtops; Caesarstone Statuario Maximus on the island and Raven against the walls. More info on main page.